The Saguaro Cactus (pronounced Sawarro) is the largest of the cactus family and can live to be 150-200 years old. These are found in The Sonoran Desert of Arizona and Mexico and occasionally in southern California. These cactus have one tap root that only goes down about 2 feet or so and other roots that spread out just below the surface and spread out as far as the plant is tall. Although a 10 year old plant might only be about 1″-2″ tall, they can grow to be 40-60 feet tall and sprout their first “arm” at about 150 years old. The Saguaro get most of their moisture during the summer rainy season and can end up weighing between 3000-5000 pounds. Arizona has strict regulations about harvesting or collecting Saguaro. Once a Saguaro dies, the woody ribs can be used to build furniture, roofs, or fences. We hopped in the car and took a day trip down from our winter home at Rover’s Roost RV Park to visit the Arizona-Sonoran Desert Museum, the Saguaro National Forest and maybe the International Wildlife Museum. We headed down I-10 and entered the Saguaro National Forest from the north. Although the visitor center was closed due to the federal government shutdown, the park/forest was open and we could wander all we wanted. As usual, you can click on any of the thumbnails below to see an enlarged view and then you can scroll right or left to see the next picture. There’s so much to see … even though we’re not hikers. And there’s many other types of cactus growing in this region besides the Saguaro. Some of it is even flowering now in the midst of winter when generally this happens in the spring. We then drove on down the road a bit to the Arizona-Sonoran Desert Museum. But as it turned out, the entrance fee was $25 each and we were already half way through the day. We decided that for that price we had better come back another day to be able to take advantage of all the museum has to offer. We’ve heard lots of great comments from friends who have been there and want to be able to get our money’s worth. But if you just can’t wait for our post about the museum, here’s a link to their web site to find out more. Lunch is always a highlight of my day and this one was no exception. At the south end of the park trail is a nice little cafe called “Coyote Pause Cafe”. After a late lunch we moved on down the road a little further to the International Wildlife Museum on Gates Pass Road. Although this museum costs only $7 each to get in, it was getting into mid-afternoon and we wanted to hit the road (I-10) before the Tucson rush hour traffic. We’ll come back another day here too. But at least now we know what we want to see and where it is. Thanks for coming along and be sure to sign up to get our future blog posts automatically by entering your email address in the little box on the left side where it says “Sign Up To Follow Our Blog”. You can check out all our RV full-time travel videos at herbnkathyrv on You Tube and click SUBSCRIBE down in the lower right corner of any of our videos. 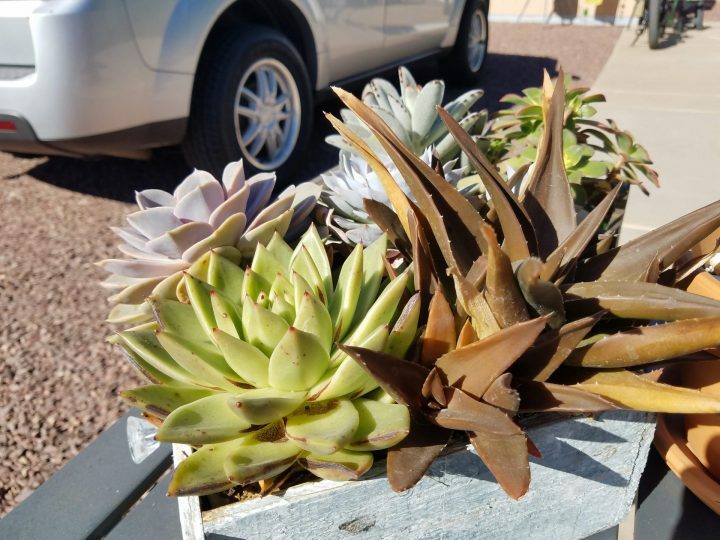 We took a drive over to Avocado Nursery near Coolidge, AZ – only about 20 minutes or so northeast of our spot at Rover’s Roost RV Park. Kathy had a small Barrel Cactus that she had bought at Kroger in 2016 and it’s been on the dashboard of the coach ever since. She’s re-potted it a couple of times and our daughter Sara had given her others to add to her collection when we were visiting Ohio back in the spring of 2018. The (now brown) larger spiky cactus turned brown seemingly pretty fast. We weren’t sure if it just got too much sun, was infected by some sort of bug, or was just root-bound. The Barrel Cactus along with the others seemed to be doing ok, but we decided it might be a good thing to get some larger containers and re-pot them into fresh soil with larger surroundings so they could flourish. We don’t know what we’re doing when it comes to plants and flowers, so that’s why we hit the road — besides, we like road trips – no matter how long or short they might be! They couldn’t tell us definitively what had caused the one plant to go brown all of a sudden, but they offered to get us some other containers and also do the planting for us. Ordinarily this would be something we’d do ourselves but living on the road in an RV means if we bought a 5# bag of soil, and some gravel for the bottom we’d still have to lay out a tarp at our site (all gravel and concrete) and we’d most certainly have leftover soil and gravel to deal with getting rid of. It was just so much easier to let them do it for us. While we were watching and visiting with the ladies doing the re-potting, I took the opportunity to talk with the owner, Phil. Phil and his wife bought the 10 acre property in 1980, built their home, and began to build the nursery. They were both school teachers (Phil taught vocational agriculture and horticulture for 30+ years) and had the summers off and although the southern Arizona summers can be brutal, these two forged ahead and built their home, the greenhouses, and all the other little buildings on the property, all while building the nursery business at the same time. Although Phil’s wife passed away a few years ago, he and his 6 employees work 6 days a week to keep this retail garden nursery open along with working at their 300 acre wholesale nursery up near Douglas, Arizona. Kathy and I walked throughout much of the 10 acre grounds and wanted to share some of what we saw. Here’s a sampling of what we found at this rare find in the desert. And as always, you can click on any photo to see an enlarged view. Although you don’t see a lot of pretty multi-colored flowers like those of us from the mid-west are so accustomed to, when we look closely we can see the buds and blossoms on the cactus and see the beauty that the desert has to offer. Kathy and I heard about a nice drive we could take down into a canyon to Clear Creek, just a few miles down SR 260. It started out as a dirt road off the state route, then became a dirt trail, then became a “rock” trail and finally down around through a lot of tight switchbacks to the “Bullpen” Day Use Area. The creek is flowing fiercely since the snow melt is rushing through every crack and crevice it can find. You can hear the rushing water in the video below. The ground is soaking up the liquid sunshine and still plenty of water rushing by to the rivers and irrigation ditches. We are continually fascinated by all the beauty there is to see here in Arizona and although we’re excited about our next trip (east to Florida, Ohio, Michigan) we’ll certainly miss the beauty around us here and especially the friends we’ve made. While staying at the Escapee’s North Ranch RV Park just outside of Congress, AZ we took regular daily walks around the park. On our first or 2nd time out, we found a real gem that the volunteers here have lovingly developed and cared for over the years. The Saguaro Cactus Garden has hundreds of different varieties of cactus and other local vegetation. We took lots of pictures and wanted to share these here. Check out the largest Saguaro Cactus in the garden that Kathy’s standing in front of, nearly 30 feet tall and experts have estimated it’s age at about 600 years old! Local birds of various species peck holes in the Saguaro for nesting places. Click on any of the pictures below to see larger images. So having had a fun time with Judy & Bob, we headed out from our site at Shangri-La RV Resort @ Vista, CA on Monday the 18th and headed for another one of the Escapee’s RV parks .. This one is called The North Ranch and it’s just south of a little berg called Congress, AZ. Congress is even smaller than our home town of Mt. Gilead having a gas station, post office, auto repair shop, and a wonderful little restaurant called “Nichols West” that more than one other resident at the North Ranch told us we had to check out. We pulled in to The North Ranch mid-afternoon Monday, so we had plenty of time to get hooked up to elec/water/sewer and get our home “tricked out” for a few days stay. Tuesday morning I was up with the sun (about 5am) while Kathy slept until about 7 or so. We took a morning walk around the campground and discovered a beautiful cactus garden that has been planted and is continually cared for by some of the full-time residents here. I’ve written a short post about that garden including loads of pictures of these beautiful and rugged flowering plants. While strolling the garden, we met Ruth who shared with us some information about the gardens and we sat and watched all the different bird species flying in and out of “Methuselah”, the 600 year old Saguaro Cactus that’s peppered with holes the birds have used to make houses and nesting pods. Ruth and her husband Dave were originally South Dakotan’s but have been full-time RV’ers for years now. They Workamp sometimes for a few months, sometimes just traveling visiting friends or locales that they’ve never been to. Turns out Ruth and Dave are in the site right next to us. The rest of the day Tuesday took us on a LONG drive, ended up being about 12 hours of driving up to the Grand Canyon and back with just over 500 miles. We took a circuitous route up Route 89 into the hills with a lot of “switchbacks” so thank goodness we were driving the car and not the motor home! We stopped for lunch in a wonderful little town called Williams, AZ and known as the “Gateway to the Grand Canyon”. Wednesday brought a more laid back day. In the morning I washed the driver side and rear of the motor home (they were in the shade) and then we took a drive early afternoon down the road 30 minutes or so to the historic gold mining town of Wickenburg, AZ. We strolled the sidewalk poking our heads into the shops peddling local artwork, leather goods, sliver jewelry, and a couple junk shops too. I was pretty proud of Kathy, she only spent about 90 bucks! Thursday was an even more laid back day. We stuck around the park, washed the car and the other side of the motor home, went down to the club house and were entertained by local park residents (both full-timers and drop-ins) for the weekly jam session. All are invited to play or just listen. We listened and enjoyed since neither of us have any musical talents. The highlight of the day (besides the jam session) was our quick trip 6 miles north to the local gas station to buy some ICE CREAM for our nighttime snack! We generally buy our groceries at a local Walmart (since we know what to expect) and prepare and eat our meals at home. We generally take walks in the early morning and just before sundown when it’s coolest and we enjoy seeing the desert critters scurry about. Today it’s Friday and we are heading out to meet Paul and Sue Middaugh, who live in Surprise, AZ. Kathy used to work for Sue at the Mt Gilead Rite-Aid pharmacy. Sue and Paul moved out here about 3 years or so ago. We’re meeting them and then heading to Sedona for the day to see what kind of trouble we can get in to. More on that day trip later.